QuickBooks Enhanced Inventory Receiving(EIR) is the best feature accessible by QuickBooks Desktop Enterprise V12. It changes past transactions when started. It manages the complete new process for receiving and paying the items. To confirm, this feature can be valuable to your business, you have to give the answers to the following questions. If your given answer is “yes” to any of these, it might just work for your business. Do you receive a bill that covers multiple item receipts? Have you paid for the items prior to receive them and do not want to increase your inventory quantities? Do you collect multiple bills for one item receipt? Want to different items receipts from accounts payable? 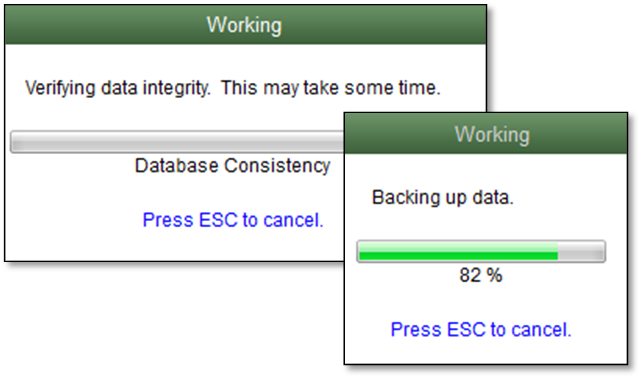 Note: It is highly important to create a backup of your company file before go to the following steps in this blog. Remember that Enhanced Inventory Receiving(EIR) is the feature, that you can not turn off once it turned on. It is preferable to run a test using a copy of your company file and analyse if it works with your business. You have to do compress your company file if it is too large. What happens after turn on EIR? After turning on this feature, Bills do not increase inventory items and bills generated from items receipts no longer exchange items receipts. Item receipts do not affect Accounts Payable anymore until you receive a bill for open an item receipt. If you receive a bill with separate costs equated to the connected item receipt, program spontaneously changes the item cost on the available item receipt. 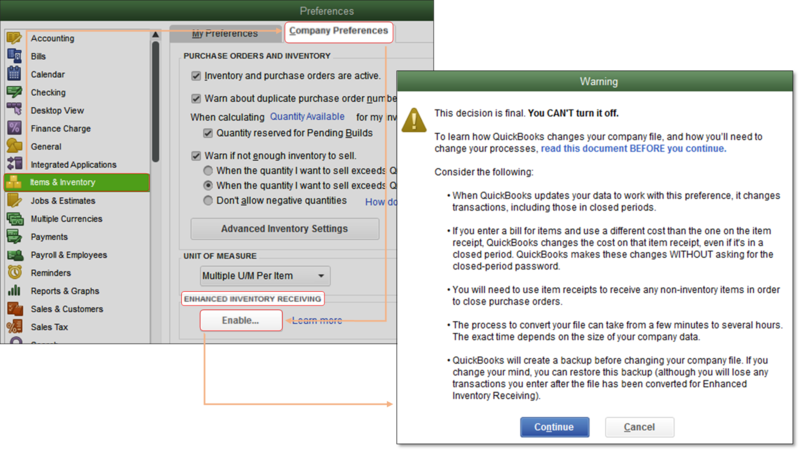 QuickBooks Desktop calculate again the inventory average cost when new item receipt is entered. Each day Item receipts change the order of inventory transactions and periodically results in average cost. After turn on the Enhanced Inventory Receiving(EIR), the process generates the receipt for each bill in your company file that contained items hence increases the number of your transactions. Third-party applications that influences inventory may not be work as supposed with EIR. You can not add a negative item to Item Receipts or Bills. You can not add expenses to the receipt of items. If you generate a purchase order for non-inventory items, you have to receive them with an item receipt to close purchase order. You can no longer assign the items as “Billable” on item receipts. After turn on EIR, when you separate receipt of the item from the bill you have to find the way to account for the value of the received item. With EIR QuickBooks Desktop developed an Inventory Offset Account. This account works as an opening account between item receipts and bills. After you enter the bill for an item receipt, the amount of the transaction cleared from the Inventory Offset Account and credit to the payable account. When you turn on EIR, QuickBooks Desktop generates these transactions in the way that common reports in QB may not look the way they used to. For example: After turning on EIR, Act. cost shows 0.00 in job profitability detail report in a company file. With turned on EIR, the item used in generating bills is spontaneously related with Inventory Offset Account( other current liability) instead of the account used at the time you initially set up the item(income or expense account). The default filter of job profitability detail report is Account: All income/expense and Name. Therefore, add or change the filter “Account” to Inventory Offset Account gives you the actual amount of Act. Cost column. Go to the following instructions to activate this feature. Choose the Edit menu, click Preferences then select Items & Inventory. After that, on Company Preferences, tab click Enable below Enhanced Inventory Receiving section. After the warning message click Continue. A pop-up message comes out to back up your company file. It may take some time to complete the process, due to the size of your company file. After finished, QuickBooks Desktop will generate the review of changes that occur during this process. Single transaction: Enter the bill which enlarges your inventory on hand. Multi-transaction: Add an item receipt to enlarge your inventory and list a bill opposed to the item receipt. An item receipt to enlarge inventory close by. Or, A Bill to pay for the items. (Item receipts do not influence your Accounts Payable not anymore after EIR turned on). You must enter a bill as opposed to an open item receipt in order to see the exact value of your payable account. Note: This process claims only to bills. Using Checks and Credit Card, you can still enlarge your inventory Amounts and pay for the items in one step. I hope you found this article useful. Still having issues related to this, Contact our QuickBooks Helpline Number +1-855-441-4417 to get instant help with best service.